We provide quality storefront installation and storefront repair in New York. Our services include glass windows, aluminum hardware and more. Call (718) 445-9200 today! A glass storefront is a great way to welcome customers into your office or business. Most clients will see your storefront or entryway before the inside of your building so why not use it to help make a lasting impression? Storefronts are an extremely useful way to give your business a more welcoming appearance by letting in natural light and exposing a glimpse of your building’s interior to the public. But why stop there? We can help you design a storefront that not only is functional and also expresses style and elegance. 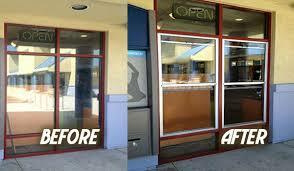 We also help in storefront repair. Our experts can help you keep your storefronts looking its best with repair and restoration services. In fact, we’ve helped businesses throughout New York and the surrounding communities repair and restore storefronts.When you come to Armor Locksmith, you’ll have access to a team of brilliant minded locksmiths and designers who can work with you to get the most out of your storefront. If you’re not happy with your existing storefront, give us a call and let us put our team to work for you. We’ll work with you to improve the current structure and get the most out of your investment. Whether you need a new storefront on an existing building or specialty glass for your industry, Armor Locksmith has your solution. We’ve been providing quality commercial glass for companies throughout the area and offer materials for affordable prices on all commercial glass products including the finest restaurant sneeze guards, storefronts, display case glass, as well as commercial doors. When in need of aluminum storefront windows installed whether a repair to an aluminum door, replacement of glass, or fabrication of framework; Our locksmiths have the parts and know-how to make or fix it all. We stock raw aluminum extrusions so that when the need arises, we can cut and punch the frame members and assemble the units for installation to complete your project. We even work on awnings. Our technicians are factory trained in storefront repairs and service on for almost every type of commercial window product in the marketplace. They are known for their imagination and ingenuity. Importantly, we do not use any subcontractors. They arrive in uniform with a fully equipped truck so they can complete the service repair and get your business back to normal as quickly as possible. We leave your business with the area clean, and windows properly fixed. With every fixed or operable commercial glass style that may be required. All our Units are easily repairable sash and glass, and automatic locking spring latches. Last, but not least, we install using the finest internal and external glazing materials and techniques. We maintain an extensive inventory of each brand’s styles and features. Once we have the exact size measurements of the storefronts best suited for your needs, our in-house fabrication department uses our equipment to design, weld and fabricate the doors to your exact measurements. When performing an installation or a storefront repair, our technicians always arrive on time, with fully equipped trucks, the right parts in the right sizes, and with all the tools and equipment they need to complete the assignment. They work with minimum disruption to your business, and when the storefront repair is finished, they take away the parts and systems that were replaced and they leave the serviced area clean, with windows properly repaired and installed and functioning. The best windows, the best fit, the best installation techniques. Whether you need custom door installation or need to replace your building’s exterior door, Armor Locksmith has the solution. During your free estimate, we will work with you to discuss the security, traffic, and weather needs of your building. We provide custom fabrication and high quality. Storefront repair to ensure that your business can continue day-to-day operations as efficiently as possible with your exterior door. For your New York area supermarket, retail store, office building, or healthcare office, we can provide and install the best exterior door solution. Call us today to schedule an appointment at your New York area location with the professionals at Armor Locksmith. For all of our installation, fabrication, and replacement services, we use only the highest quality materials and products to ensure that your new door will keep your property secure, energy efficient, and accessible for years to come. There are many reasons you might need commercial door repair, but no matter the cause, it’s critical to get the problem fixed quickly—for the security of your building, the safety of your employees, and smooth operation of your business. Our technicians arrive at your location with the skills and equipment necessary to fix your commercial door and get your business back up and running. We provide 24/7 service, so call us today for emergency or scheduled commercial door service! Our technicians arrive at your location with the skills and equipment necessary to fix your commercial door and get your business back up and running. We provide 24/7 service, so call us today for emergency or scheduled commercial door service! Why choose Armor Locksmith? We are dedicated to providing the best value in commercial doors, products, and frames to our customers—When you work with us, we: send only the most professional, knowledgeable, and well-trained group of installers—never sub-contractors! Offer outstanding customer service Provide the highest standards of integrity and quality in the industry Strive for professional (but efficient) installation and repair service no job is too big or small for us!